I found this poster on Pinterest and adapted it to suit my classroom needs. It is super easy to make…and you can go crazy with the fonts. 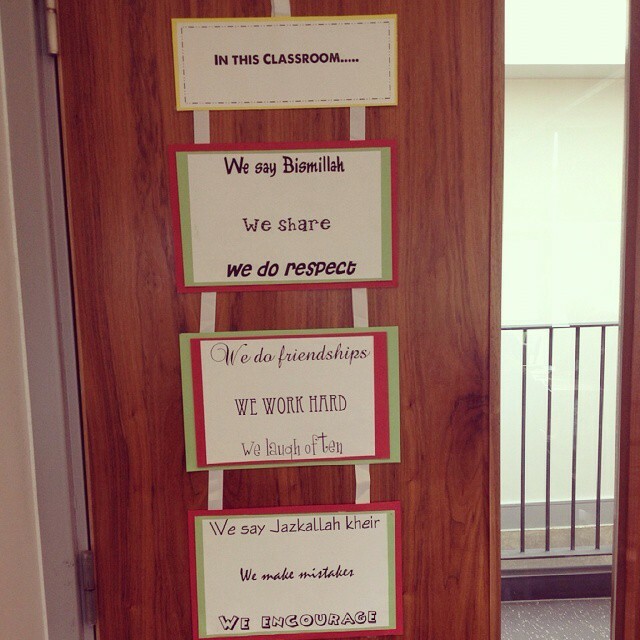 My teaching assistant is in charge of sticking this on our classroom door and a quick glance every now and then at it while I’m teaching helps me to stay focused on the kinds of feelings and good adab I need to instill in the girls. Obviously, the girls will do as you do and not as you say. If you make one of your own, send it to me and I can show case it on this blog insha Allah! This entry was posted in Behaviour, General, Organisation and tagged Adab, Arabic class, classroom, Islamic classroom, Islamic poster, Muslim classroom, Qur'anic Arabic. Bookmark the permalink.